Hyaluronic Acid is a component of connective tissue whose function is to cushion and lubricate. When skin is exposed to excessive UVB rays, it becomes inflamed (i.e. a sunburn) and the cells in the dermis stop producing as much hyaluronan, increasing the rate of its degradation. The presence of hyaluronic acid in epithelial tissue has been shown to promote keratinocyte proliferation and increase the presence of retinoic acid, effecting skin hydration. Each moist sheet has cutouts for eyes, nose and mouth. The soft mask conforms to the shape of your face, hugging the key areas around the eyes, nose and mouth. 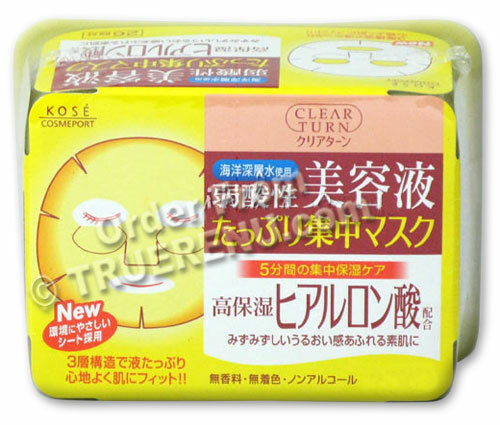 Ingredients: Water, BG (butylene glycol), glycerin, dipropylene glycol, PEG-8, coix lacryma-jobi (job's tears) seed oil, laminaria japonica extract, PEG-50, hydrogenated castor oil isostearate, citric acid, sodium citrate, triethyl hexanoine, methylparaben.